In February 2011, we made a decision that surprised a lot of bike tourists… We put our sturdy Long Haul Truckers in storage and started touring on the unlikeliest of bikes – the Brompton folding bike. Traveling on the Bromptons meant that transit connections would be simpler, allowing us to get straight to the best riding. Traveling on the Bromptons also meant that we could prove a long-held belief – that you don’t need specialized touring gear to have a great cycling adventure. We knew we were flowing against the grain, but we also knew that the Bromptons could handle it. 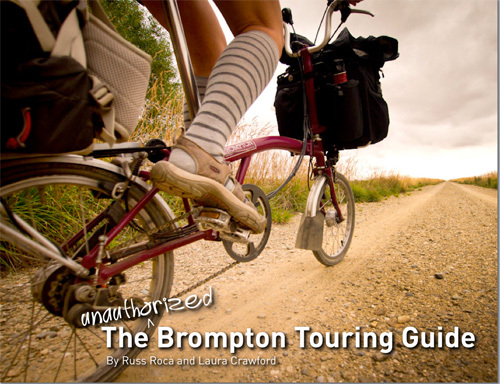 The Unauthorized Brompton Touring Guide is 41 pages of in-depth information about how to set up your Brompton for touring, how to pack, how to maintain your new touring machine and troubleshoot any issues you might have on the road. You’ll also find links to videos we made while traveling on our Bromptons and external links to helpful resources. 1. Introduction: Why did we initially choose to tour on Bromptons? 2. Meet Brompton: What is a Brompton folding bicycle? What sort of touring is ideal for a Brompton? Yeah, but, can you really tour on a Brompton? Folding Bikes vs. Small Bikes. 3. Building a Touring Brompton: How do you navigate the near-infinite combinations of Brompton builds? Which Brompton do we ride? In-depth explanation of why we chose the components and details of our Bromptons. 4. Packing a Brompton for Touring: What options do you have for packing a Brompton for travel? Front bag only vs. front bag and saddlebag vs. front bag and backpack. How can you trim down your gear? What gear do we carry? Includes links to several videos in which we further explain how we pack. 5. Taking Transit with a Brompton: How easy is it really to pair the Brompton with transit? How do we fly with our Bromptons? 6. Cheating, Ride Sheds and Jet Packs: Is it “cheating” to take transit on your bike tour? 7. FAQ: What questions do we asked all the time about the Bromptons? How do we respond? 8. Maintenance and Troubleshooting: What’s in our basic repair kit? What additional tools and supplies do we take for a long tour? What are the most common maintenance issues? 9. Conclusion & Resources: Our parting thoughts and links to more information. 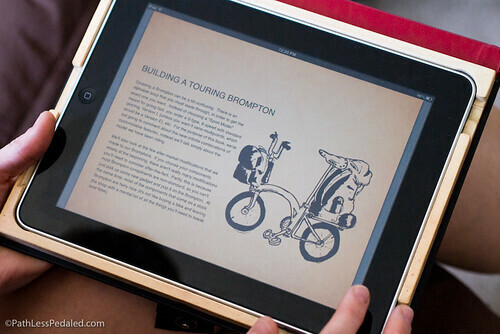 The Unauthorized Brompton Touring Guide is a downloadable ebook. 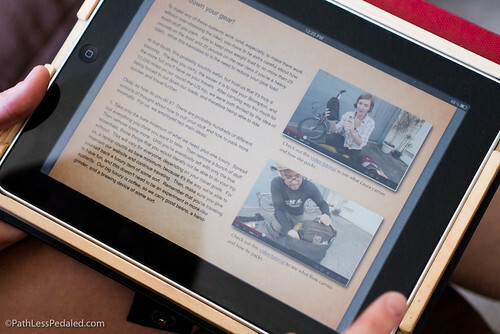 You will receive a file in a PDF format, which should be readable on any computer, as well as iPod/iPhone/iPad and some e-readers (it is not currently optimized for the Kindle, however). Upon purchase, you will be directed to a link, from which you’ll be able to download the file. We hope this book inspires you to dream big about where you’ll next take your Brompton – and we look forward to hearing about your own adventures on the road!